1. Celibacy is a gift beyond vocation. When a man or woman offers their life to God as a celibate, it is a gift. They give their life totally to God including the resolution to not have a family. This is a beautiful decision and one I believe God appreciates as well as graces the person to fulfill. Humanity is made for communion, we are deeply seeded with this yearning ultimately discovering it is a yearning for communion with God. God provides a temporal satisfaction of this communion when he made man and woman and declared they become one flesh. The celibate forgoes the communion of another human and works to fill this communion with God for their entire promise. All giving requires sacrifice, as we witness in Christ and the Cross. In many ways the gift of celibacy is a lifelong sacrifice to God by one who has love like Christ. It is a gift with a cost. Celibacy loses its giftedness when we make it an entrance requirement to become a member of the priesthood or religious life. Do I want to become a priest or do I want to be celibate to express my love for God? Of course God knows the answer to this question in each vocation. But is their clarity for the one offering themselves? How can a life of priestly vocation or religious life have the direct connection to sacrifice if it is a response to the desire for a particular vocation? It may not be pure gift anymore if I am getting the life I desire, I want to be a priest so I accept celibacy. This could be less of gift, although a tremendous sacrifice non-the-less. I suggest separating celibacy and vocation to priesthood or religious life can bring clarity to the one ordained or professed. A married priest and a celibate priest can both serve like Christ as the High Priest. But only the celibate can fulfill the sacrifice like Christ and the Cross. 2. A married priest enriches the clerical convocation and the individual cleric. In the stories shared by those who were victims of homosexual advances of bishops and other priests, particularly in the seminary; a primary message heard was there was no way of knowing where to turn for help. Even in the cases of children sexually abused there are stories that they went for help to another local priest only to be threatened, beaten or further abused. If the culture of the seminary and convocation of priest, particularly at the diocesan level, is homogenized to be all celibate men there is this concern about who to trust and what responses a complaint might receive. Imagine if this culture was more heterogeneous, married men with wives and potentially families, now there is an avenue for a seminarian or priest who has been approached sexually or seen something to trust. First, a seminarian or priest being taken advantage of can hope speaking to a married man they will be received empathetically, particularly if he is a parent himself. Secondly, there is no denying that the wife of a married priest would be able to listen and hear the troubles of seminarians or priest being taken advantage of and give support. The slogan, “behind every good man is a great woman” lives because there is much truth to it. Sometimes a maternal instinct is needed for trust and encouragement. With wives and mothers inserted in the clerical convocation both faces of God are truly available, God the mother and father. It is possible this simple change if it had been available in the seminary where bishops took advantage of young men could have ended particular situations years ago. Expanding the convocation of the clerical to include married priest in numbers matching society enriches every member including the one who is celibate. “It is not good for man to be left alone.” (Gen 2:18) It seems it is even less good for an entire convocation to be left alone. 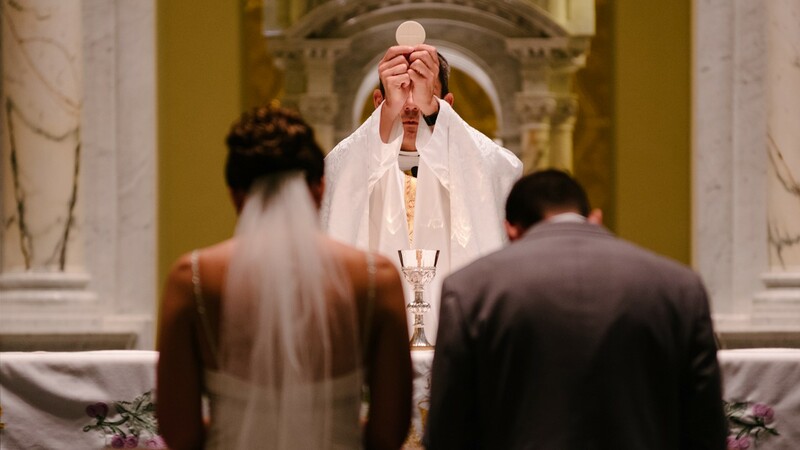 A married priesthood can have a positive influence on the entire presbyterate. 3. Only an unmarried priest is available to love and serve the entire flock is a false argument. A reason often cited for an unmarried priesthood is so the man can dedicate his entire life to their flock. An example; a dying parishioner needs last rites at the same time the married priest has a conflict at home. Or generally, the married man needs to dedicate a certain amount of his time to his family which will take him away from the flock. It is a reason dependent entirely on availability and time. There is any number of examples where dedicated individuals made sacrifices in their family life to achieve something bigger than themselves. Do we think Steve Jobs, Bill Gates, Martin Luther King, Jr. could have been more successful or would have had more time and availability to give to their cause if they were never got married. Being good at something has as much more to do with training, passion and luck and less availability. Every life has distractions, if not a wife and family the diocesan priest worries about retirement, their days off are important to them, they foster friendships that are important and need their priority, they have families, moms and dads who are a priority. Married or not managing the priorities of a vocation must be addressed by every individual. Good leaders know how to manage many activities at the same time and dedicate the necessary amount of passion and energy to their vocation. Additionally, rather than seeing the family of a married priest as pull against the priest time it becomes possible to see the wife and children as additional resources to dedicate to ministry. We are in an age where ministry requires the involvement of every member of the parish. The type of thinking that it all falls on the shoulders of the priest is a model of lost discipleship. A married priest can actually be an asset not determent to the presbyterate. 4. A married priest also witnesses a God who is love. The simple comment from Dr. Hahn looks to the divorce rate among protestant pastors as a problem not needed in the Roman Catholic Church. I think an argument can be made we already have this problem sacramentally. In the U.S. there are greater than 25,000 men (depending on where you get this number of course.) who have left the priesthood for love. The process known as laicization is a dismissal from the clerical state with dispensation from all obligations including celibacy. It has been written about by Pope Benedict XVI as recently as 2009 and is part of the Cannon Code. For many they have met a woman and have fallen in love. So their love pulled them from their vocation because they could not be married and celibate. They were not bad priest, if fact many likely very good priest. Beyond those that leave, we aren’t aware of those who have a secret girl friend and even children. Of course there are arguments to be made about broken promises, and vows; but this like divorce, is happening in reality. With approximately 37,000 priest in the U.S. the number of laicized priests is much higher than the divorced protestant pastor percentage. So in one sense we have the problem of divorced presbyterate already. Comparing the laicized priest to the protestant pastor divorced may not be fare but it does have some comparisons, at least sacramentally. Some of the more physical problems may be easier for the laicized priest, when he leaves the church financial structure he is on his own. If a priest who is married divorces the question becomes what are the financial burdens on the church? God is love. If a priest falls in love, despite dedicating chastity to God through his priesthood what does it say about God? Both love and celibacy require grace to be fulfilled. Is God favoring one over the other in his life? I don’t know the answer. If two become one, then God is present and I think although denying their celibacy, this man can still be a good priest. Maybe it is pleasing to God to promise celibacy for a number of years and not the totality of life. After all the 20 year old man is very different from the 50 year old man. Honestly I think God is pleased no matter what we give, marital love or celibacy. I think a married priesthood is good from a number of views. Of course there are problems; what happens in the case of divorce, at what point in the married man’s life can he be free enough to study and become a priest, how does the church handle the physical (i.e. financial) needs of the family. I think it would be wonderful to have a conversation about these things and I am sure answers can be found. Rather than looking at the married protestant pastor’s down side of divorce and whatever other problems this may bring as a reason not to go any further, why not learn from what they are living and see how it can work and perhaps be improved in the Roman Catholic Church environment. I agree with Dr. Hahn’s premise, a married priesthood by itself does not solves the sexual abuse issues highlighted in the news. I do have some suggestions about systematic change to address the church’s problems in this area see article. But I think a married priesthood enriches the church. Married men served as apostles for Christ and I think we can agree they did a good job. As a married man, a father and grandfather who has worked many years in ministry I have heard often that a priest (who lives alone in a rectory, with a lifetime salary guarantee, health care insurance and many other services available to him) does not understand the problem of the modern family. Whether this is true or not; the impression exists and it disrupts the pastoral influence of the priest today. I love priests and thank God for them, I think we can help them and the church by separating celibacy from their beautiful vocation.